Before becoming a mom I pretty much lived for one sport, and one sport alone - hiking! I liked skiing in winter and dabbled in mountaineering as well, but hiking was my passion and I was out climbing mountains every weekend from May through October with my husband and friends. We've done two overnight lake paddling trips now as a family with an overnight river trip planned for this summer, and we pretty much plan our whole summer around where we can camp and paddle from the same location. And while I don't proclaim to be an expert by any means, I've learned a few things about paddling with kids. What is recreational kayaking? Check out the story I recently wrote for Campers Village titled: Top Things To Know about Recreational Kayaking. While nothing can replace taking an introductory lesson, this story seeks to at least get you pointed in the right direction towards becoming a paddling family that chooses to kayak instead of canoe. In reality, it doesn't matter whether you canoe or kayak. You do what works for your family and what you are comfortable with. I personally feel very unsafe in a canoe. Others feel incredibly tippy in a kayak. To each his own. BUT, you do need to know where to go paddling in whatever vessel you choose to use. You can rent boats from the Banff Canoe Club on Bow Avenue downtown Banff. A season membership costs you $40 with your first hour of canoeing included, and then you can rent for the rest of the summer and autumn for $15 per hour. If you have your own boat, you can still put in near the Canoe Club docks and paddle up Echo Creek to Forty Mile Creek and on to the First Vermillion Lake. 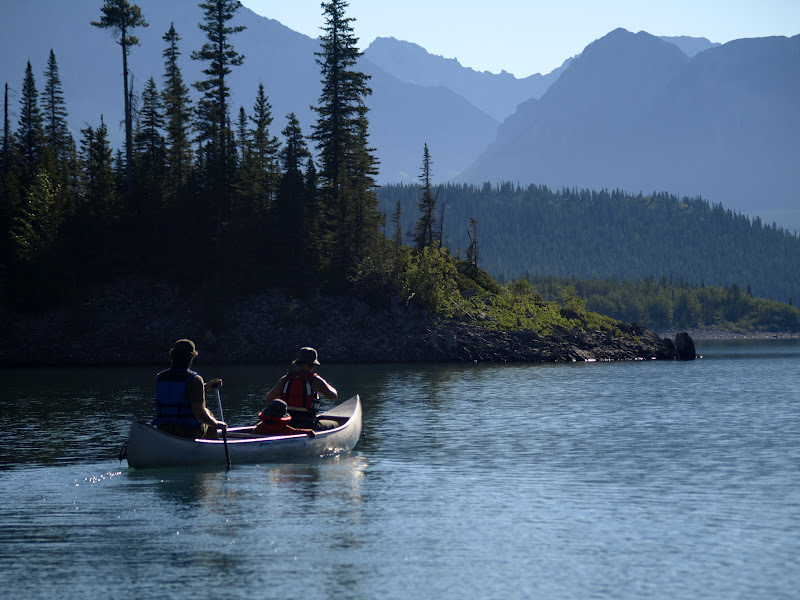 Paddle around the lake as long as you want or even follow the small channel to the Second Lake which runs parallel Vermillion Lakes Drive. Returning down Echo Creek is easy going down stream all the way back to town. To see a map of the area and where you'll be paddling, go to the Parks Canada website and open the PDF document for the Town of Banff Area Map. Johnson Lake is another good family paddle in warmish water (warmer than the other mountain lakes anyway) and it's the only lake in Banff with a good sandy beach. Johnson Lake is located on the Lake Minnewanka Loop Road and is close to Two Jack Lakeside Campground should you want to camp. And, Two Jack Lake is another good lake to paddle with kids. It's colder and doesn't have a sandy beach, but it does have a rocky beach kids could play at. For more information on paddling in Banff, visit the Banff National Parks website. Barrier Lake is one the smaller lakes in Kananaskis and thus safer with children because it doesn't get as windy as the larger lakes. Kananaskis Outfitters is your source for rentals in the area and can be found at Kananaskis Village nearby. Lakeside rentals are available on weekends in summer but check with the company first to inquire about their schedule. Last year they even rented stand up paddleboards at Barrier Lake! A couple of years ago we did our first overnight paddling trip as a family and I learned a couple of valuable lessons: One, you don’t have to actually carry your gear to get into the backcountry if you use a boat, and Two, you don’t have to carry small children either! Canoeing or kayaking into a backcountry campground is by far one of the easiest ways to access beautiful wilderness locations as a family. No backpacks, no child carriers, no strollers – and you can do the trip in sandals! Two adults, two kids AND a dog! Now that's a full canoe! I wrote a story titled Easy Overnight Paddle Trips for the Whole Family, and in this story I talk about what kind of boat to use, how to pack, and where to go in the Canadian Rockies with children for that first trip. Even if you're not new to paddling, check out the story for my favourite water accessible campgrounds. I've listed some of my favourite lake and river campgrounds in Southern Alberta that you'll want to check out. See you on the water this summer! Thanks Tanya! Your blog had all the background I was hoping for, but missing from the Parks Canada site. Great tips and much appreciated.